Introducing the latest version top flight edition of Microsoft Office offering the full suite of office applications, for all your word processing, database and emailing needs – Microsoft Office 365 Home . This comprehensive Office package builds on the successful Office 2010 and Office 2013 and brings a whole new level to your everyday computing. Microsoft Office 365 Home is designed with you in mind. Create and communicate faster with app based features, designed to save you time, all wrapped up in a clean and modern package to satisfy your home office or business needs. Microsoft Office 365 Home has been optimised for Windows 8 and boasts an improved user interface making it simple to use on touch, pen and keyboard based devices. Nonetheless with Microsoft Office 365 Home Premium all features and functionality are available on non-touch based systems, and older versions of Windows, and will work seamlessly with a traditional keyboard and mouse. Boasting a fresh and exciting new Start screen to allow access to a variety of recent documents and templates, this new and improved look will reduce distractions and afford a better reading experience so you can complete your work in record time. With 60 minutes of Skype calls to phones in over forty countries every month (for 12 months) included with Microsoft Office 365 Home you will be able to not only stay on top of your work, but also find time to take a break with a cup of coffee to have a natter with friends. Microsoft Office 365 Home allows you to install Office on up to five PCs or Macs, Windows 8 tablets and iPads. Equipped with SkyDrive, Microsoft Office 365 Home facilitates the uploading of files to your 1 TB of cloud storage for you to access from any Web browser, PC or Mac without the need for manual syncing or a tangled mass of cables. All you need to do is login to skydrive.com from any compatible browser to start viewing and editing your work. In addition to saving your documents to SkyDrive online, Microsoft Office 365 Home will by default save your work to a local SkyDrive folder on your computer which automatically syncs to its online equivalent. The benefit? You can access your documents in the local SkyDrive folder on your computer at any time without needing to be connected to the internet. Built upon the successful foundations of previous Microsoft Office iterations, Microsoft Office 365 Home features new, improved and streamlined editions of the core office and database applications of Word, Excel, PowerPoint and Access for creating more visually compelling and easily digested documents, spreadsheets and presentations. With a host of smarter applications such as Quick Analysis and Charts Animations in Excel to aid quick and effective data visualisation, and the ability to drag and drop pictures, videos and online media into your word documents Microsoft Office 365 Home will banish once time consuming processes to the depths of history. The inclusion of OneNote, the new digital notebook, will allow you to capture and then share pictures, web pages, notes and even voice memos with your contacts – ideal for pinging quick editorial comments and for highlighting important features. For staying in touch, Outlook will be an indispensible email and scheduling tool as on a single screen you will be able to see your calendar and appointment details alongside emails and contact information. The latest feature of Microsoft Office 365 Home, Office on Demand, comes with your 12 month subscription. You will be able to access your Office documents and settings and even exploit all the features of your full-version Office applications on PCs that don't have the latest version installed - ideal for library computing or for working on a computer you have borrowed from a friend. Accessible via an internet browser, such as Internet Explorer or Mozilla Firefox, Microsoft Office 365 Home will be at your disposal wherever you are so you aren't reliant on software installed permanently on your home computer. Your security will also be protected as once you close the applications they are no longer available to other users. 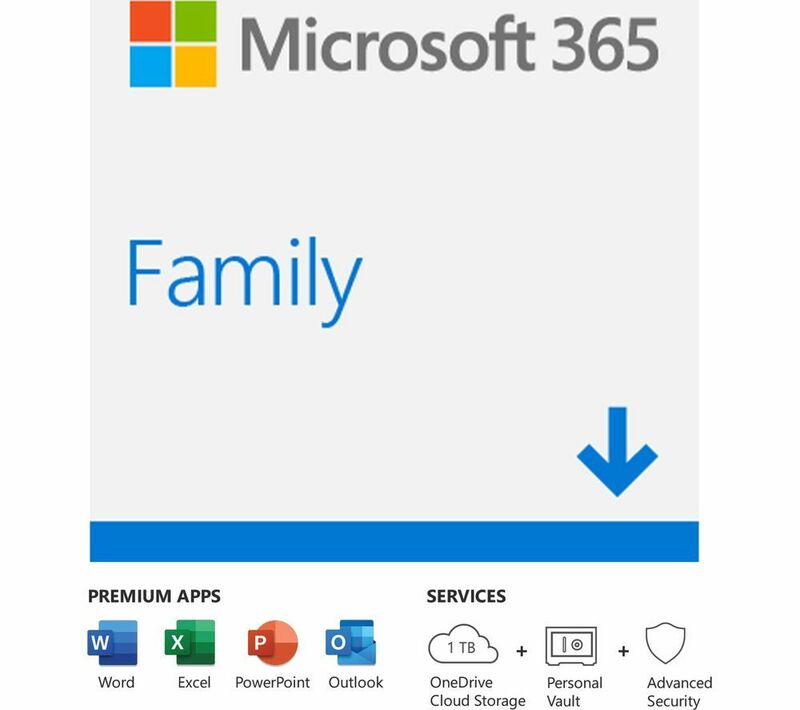 Affording you incredible computing freedom, with one convenient annual subscription to Microsoft Office 365 Home your entire household will be able to create, share and connect with supreme simplicity. Renewing your Office 365 Home? Renewing your Office 365 subscription is easy and means you'll maintain access to all your Office applications and additional subscription benefits. For greater flexibility Office 365 subscribers can access and edit Office documents on iPhone and Android phones. Up to four other users receive +1 TB of Microsoft One Drive storage and Office installation rights. If you are already an Office 365 subscriber, renewal is easy: simply add Office 365 Home Premium to your basket and check-out. Afterwards, just go to Office.com/setup, enter your product key and sign in with your Microsoft account. Mostly good all round. It's an upgrade from 2007 and it was very easy to figure out the differences. The print menu is a nuisance to use from ny previous one which was much user friendly. Free versions such as Open Office are equally as good if not better and seem more user friendly.